List, Buy and Sell New York Air Rights! New York City air rights – formally, Transferable Development Rights, or TDRs – originated with the 1961 revamping of the city’s zoning laws. In essence, if a building adjacent to a construction site is lower than neighborhood zoning laws allow, the developer can acquire the building’s unused air space, add it to his or her project, and erect a taller building. Since the upper floors of a building fetch higher prices, developers consider height to be a prime asset. Air Rights New York.com promotes unique development opportunities in New York City through the listing, offer and sale of development rights. NYC land space is not getting any larger but the concept that the sky's the limit offers interested parties the opportunity to own a piece of the Big Apple. When there is nowhere else to go, the best direction is up, whether adding space to an existing rooftop or selling the rights to a developer to construct an adjacent property, air rights offer a mutually lucrative situation for both buyers and sellers. The Zoning Resolution of the City of New York recognizes two distinct types of development rights, aka air rights, that are commonly bought and sold in the course of real estate transactions. 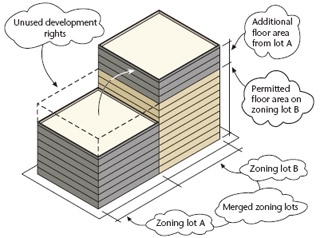 There are Floor Area Ratio (FAR) rights that can be transferred between the owners of contiguous properties that have been consolidated into a single zoning lot, and there are transferable development rights (TDRs) that the owners of certain landmark and historical district properties are eligible to sell to certain nearby receiving properties. The standard unit for development rights in New York City is the floor area ratio (FAR). The Zoning Resolution defines the floor area ratio as: “... the total floor area on a zoning lot, divided by the lot area of that zoning lot. (For example, a building containing 20,000 square feet of floor area on a zoning lot of 10,000 square feet has a floor area ratio of 2.0.)" Densities for various land uses are described by the Zoning Resolution in terms of the FAR for that use in that zone. Two or more contiguous lots within the same block, although they are owned by different parties, can be combined into a single zoning lot. The total FAR allowance for the consolidated zoning lot then can be allocated among the various parcels that comprise the zoning lot. Therefore, with the cooperation of several neighbors, a developer can build (by right) an apartment house, for example, on a lot that could not otherwise legally support such an extensive structure, based upon the unused FAR rights of the surrounding lots. This regime has the purpose of encouraging development of neighborhoods up to target density, while discouraging the demolition of the best structures within those neighborhood, since those structures can be economically preserved through the sale of the properties’ unused development rights. Copyright (c) 2012 Air Rights New York.